It’s hard to believe, but tomorrow starts June! 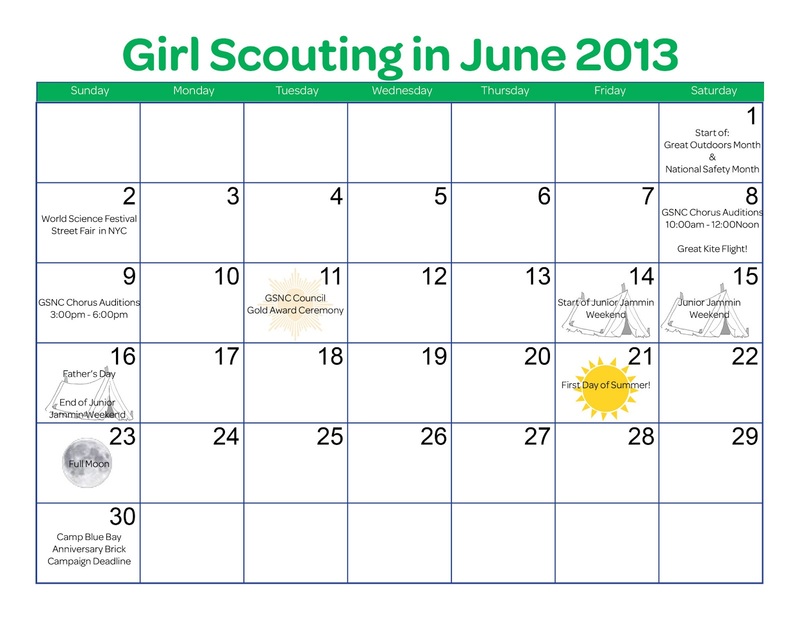 Being Girl Scouts, who are always prepared, prepare yourself for the upcoming month with… Girl Scouting in June. June 1st marks the first day of Great Outdoors Month, so be sure to take your girls outside to learn a little more about our environment. For instance, your Juniors may work towards their Camper Badge, or your Cadettes may want to work towards their Trees Legacy Badge. This month, the possibilities are endless to learn more about the Great Outdoors. Additionally, June 1st marks the first day of National Safety Month. Teach and practice keeping your girls safe and provide them the skills and techniques that they may need to keep themselves safe in the future. This June 11th is Girl Scouts of Nassau County’s Gold Award ceremony. Take this day to teach you girls a little more about each of the awards that they can achieve through hard work and dedication as a Girl Scout. The awards the girls should be aiming for are Bronze, Silver, and of course, Gold. Encourage them to continue to push forward to reach the highest achievement in Girl Scouting! June 16th is Father's Day! This might be a good time to have your girls work with their dads on things such as woodworking, car care, or even another opportunity to go camping! Those are just a few ideas on how to get your girls and their dads to work on Girl Scouting activities together. June 23rd is this month’s full moon. Use this night to take your girls out star gazing! Certainly learn a little bit about our sky and its interesting changes that it goes through each month. This will help educate Scouts of all ages, but may benefit our Senior Scouts with earning their Sky Legacy Badge. A few weeks ago, our Junior troop had the pleasure of hosting two Massapequa troops to offer support post Hurricane Sandy. Troop 3476 welcomed Junior troops 2388 & 2408 to a night of earning the Simple Foods. All items were donated by our troop and each scout learned how to set a table, table etiquette, create a healthy breakfast, lunch and dinner. We spoke about the food pyramid and topped the night off with each scout leaving with Panini desserts to take home to mom and dad. The scouts worked together in prepping, cooking and cleaning up (Yes, cleaning up). We closed the meeting with the scouts singing, "Make New Friends" in a friendship circle. Troop 3476 wanted to take action and help their community. All the scouts had a great time and made a new friend too. It was truly a terrific night and we know the scouts will continue to offer this random act kindness as they grow into adults. Joanne and I were so proud of all the scouts. A big shout out to Plainedge CAV, Linda H and CAV's from Massapequa, Debbie & Barbara along with friends Kathleen and Beth for helping our troop get this off the ground. It is times like this that I especially enjoy scouting and am so proud to be a part of. Joanne M. & Cris C.
My very first Girl Scout memory is of my life-long friend, Paula, coming to school in her Brownie uniform. She looked so special, even 6 year-old cool in her cute brown shirt dress and beanie. It was all I could do that afternoon, but run home and ask my mom how I could be a Girl Scout too. A few years later, my mom found a troop for my twin sister and me. We started our GS journey as Juniors at St. Pascal Baylon in Hollis. Fast forward through Cookie sales, fashion shows, trips, badges, learning how to swim at Camp Andre Clark, building a one-match fire on a canoe trip while at Camp Henry Kaufmann, Cadettes, Seniors, two daughters who were Girl Scouts in Baldwin, the eldest a Silver Award recipient, being a Cookie mom and then serving on the Nominating Committee and subsequently the Board here in Nassau County. On that very first day, when I admired my friend's uniform, I never imagined having the opportunity to lead my local Council as its President, but here I am today, humbled by the opportunity to serve, excited to help build young women of courage, confidence and character that will make the world a better place and become tomorrow's leaders. I am sure my Girl Scout story is like that of so many others. All of our adult volunteers who share their time and talent to nurture and develop girls are committed and hopeful for their bright futures. I am excited to work together to siege each day, and every single moment to maximize this commitment. I look forward to years of success and growth in Nassau County and hope that we, the adult volunteers continue to be THE catalyst that makes a difference in the lives of so many girls. Dove's Real Beauty Sketches Campaign...What are your thoughts? Comment below or start a conversation on the GSNC Facebook Page or on Twitter (include @GSNC and #WeAreBeautiful in your Tweet). In Girl Scouting, “Bridging” is the term used to describe the process of advancing from one level to another. It is a time to celebrate the accomplishments of a Girl Scout; she has earned Journey awards, completed badges and participated in community service and Troop outings. 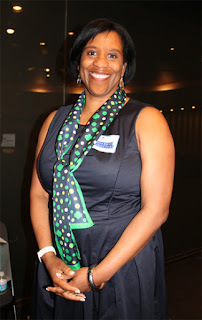 The Bridging Ceremony should be an exciting time for a Girl Scout, so make the celebration fun and memorable. And, include the girls in the planning process. An opening Flag Ceremony is a good way to honor our country. Incorporate the Girl Scout Law in the ceremony in some way. When I was a girl, our leader had each girl in the Troop say a line of the Girl Scout Law and tell the audience what that line meant to us. Don’t just invite family and friends; invite older Girl Scouts to welcome the younger girls into the next level of Girl Scouting. Present girls with their membership star, bridging certificate and bridging patch, as well as the other recognition they may have earned this year. Does your Girl Scout Troop have a favorite song or poem? Include it if it has meaning to your Troop. End with a friendship circle; it is a good reminder that friendship is continuous, especially in Girl Scouting. If you still need a guide to help you plan your bridging ceremony, try using the “Ceremony Planner” created by GSUSA. And remember, as long as the girls have a fun and memorable time, the ceremony is a success.